Straight arm pulldown or straight arm lat pulldown is an effective isolation exercise that involves shoulder extension movement for training the lats. It is performed by bringing the arms from an upward to the downward direction, which helps in strengthening your lats and broadens your posterior deltoid muscle thereby giving you a perfect V-taper. While the dumbbell or barbell pullovers also train your back muscles, the cable variation maximally targets your lats and keeps the tension constant throughout the entire movement. 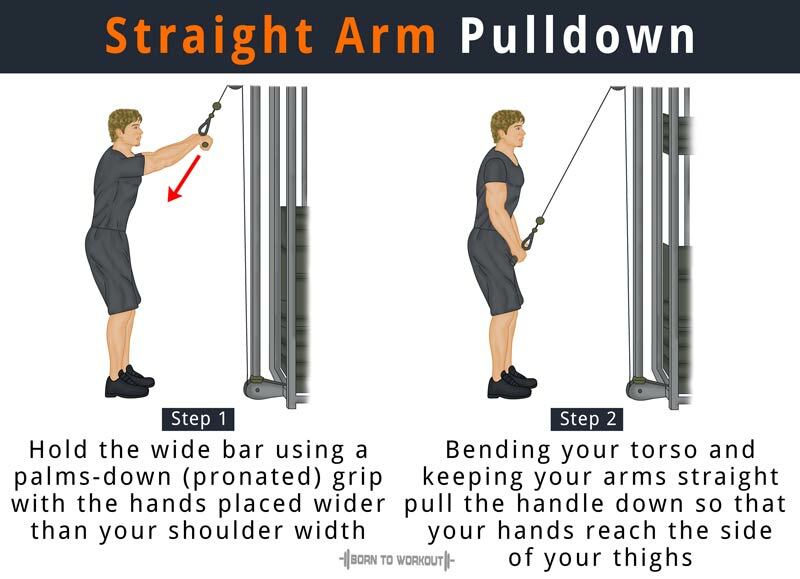 The straight arm pulldown can be used as a pre-exhaust workout before performing compound exercises or as a final move to end your back routine that may include deadlifts, seated rows, lat pulldowns, and bent-over rows. Stand in front of a weight stack with a wide-grip bar attached to it, and your feet spaced shoulder-width apart. Grab the wide handle from the top of the lat pulldown machine using a palms-down (pronated) grip with the hands placed wider than your shoulder width. Step back a few feet away and slightly bend your torso at the waist, fully extending your arms in front and then tightening your lats. Keep your arms straight and then draw your lats to pull the handle down so that your hands reach the side of your thighs. Return to the initial position in a controlled way and continue lifting the bar until your arms are roughly parallel to the ground. The exercise can also be done using a shoulder-width grip or a rope attachment. Make sure you do not bend your elbows, as it would provoke you to use the triceps for assisting in the movement. Increase the forward lean and let the wide-grip handle travel beyond your head to stretch your lats further and increase the range of movement.